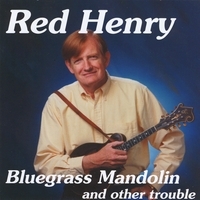 Bluegrass Mandolin And Other Trouble: Red Henry, Murphy's husband, has been playing mandolin since the 1960s. A Bluegrass Unlimited magazine review once called Red "one of the most prolific interpreters of Monroe-style mandolin picking," but Red also writes many tunes of his own. Murphy plays banjo throughout, and sings three of her great original songs. Little Big Mon, Sleepy-Eyed John, Hundred and Six Star Rag, The Darling Daughter, Clermont's Revenge, Just Because, Red's Zeppelin, Rawhide, Two Hands On The Wheel, Redwood City, Bluegrass Breakdown, Lonesome Moonlight Waltz, Two of A Kind, Granite Hill, Redwood City PM, Real Time Reel, Kiss It, Khomeini, Margaret, Perfect Mason, Grandpa Rock On, Eat My Dust.